Refusing to be cowed by a flurry of cancellations that have effectively gutted Riyadh's Future Investment Initiative - colloquially known as "Davos in the Desert" - Saudi Arabia has lashed out at the US and its Western allies, warning that there will be hell to pay if anybody dares sanction the world's largest oil exporter. If Mr. Trump is bothered by oil prices at $80 a barrel, the Saudis have wagered, imagine how uncomfortable he would be with oil at $200 a barrel? Already, oil traders have recognized Saudi's "weaponization" of OPEC's ability to control global oil supplies, while Saudi's Tadawul stock exchange plunged 8% at the lows on Sunday (though this drop was mitigated in part by a late-session rebound). But the tentacles of capital emanating out of Riyadh stretch across the world, to Tokyo and San Francisco and beyond, what one NYT op-ed writer described as Silicon Valley's "Saudi Arabia problem." And nowhere is this link more evident than with Tokyo-traded Softbank, whose shares have born the brunt of investors' indignation over the burgeoning diplomatic crisis (a crisis rooted in Saudi Arabia's suspected murder of a former-insider-turned-dissident-journalist inside the Saudi consulate in Istanbul). Softbank shares closed more than 7.3% lower on Monday in Tokyo, a move that analysts partly attributed to the instability surrounding Saudi Arabia. Since Softbank's September peak, the company has shed more than $22 billion in market capitalization, according to BBG data. A pullback in tech shares like Nvidia, in which Softbank owns a major stake, has helped weigh on Softbank shares as one BBG columnist calculated that SB's Nvidia stake was "the major factor" driving Softbank's profitability last year. Just like the broader market, the pullback in tech was inspired, at least in part, by anxieties surrounding the US-China trade war. But its Saudi ties are increasingly becoming an intolerable risk in the eyes of investors. Saudi Arabia, which has denied any wrongdoing, is the biggest outside investor in SoftBank’s $100 billion Vision Fund and is coming under increasing international pressure over the incident. Executives, including the head of JPMorgan Chase & Co., have pulled out of a high profile summit in the country and the U.S. is weighing action against the country over the disappearance. But the danger for Softbank has nothing to do with whether Saudi Arabia will face international sanctions over the incident (indeed it most certainly won't, as President Trump has already made clear). The real risk is that other investors in Softbank's Vision Fund will begin pulling their money, potentially forcing a liquidity crisis as the company remains heavily invested in several private companies. "We are not liking how Softbank has been trading and have decided to remove it from our recommended longs," Amir Anvarzadeh, a senior strategist with Asymmetric Advisors in Singapore, wrote in a research note Monday. "Although we don’t expect this latest diplomatic incident to lead to any sanctions on Saudi, there is always some possibility that some firms will pull out their money from the Vision Fund." "We are starting to worry about other more likely scenarios that could prove as disruptive to Son’s plans," he wrote. "Firstly and most importantly, we believe tech names will remain under selling pressure leaving Vision Fund’s paper profits on names like Nvidia (NVDA) vulnerable to big under-performance relative to the fund’s targets." 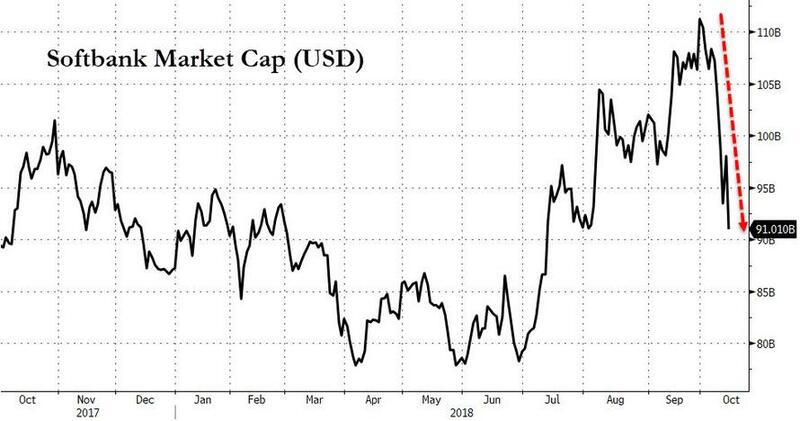 Still, some fund managers have dismissed Monday's Softbank selloff as "psychological" in nature, suggesting that this could be a good time to buy, per Reuters. With SoftBank’s Saudi ties causing jitters, the share sell-off is "more psychological than anything related to worries on its fundamentals," said Makoto Kikuchi, chief executive of Myojo Asset Management. While Uber CEO Dara Khosrowshahi has already said he won't attend the FII (Softbank owns a major stake in Uber, alongside the Saudi sovereign wealthy fund), a SoftBank has refused to comment on whether its executives would attend the event. Masayoshi Son, Vision Fund chief Rajeev Misra and ARM Holdings CEO Simon Segars had been listed as attendees on a conference webpage that is no longer available. Meanwhile, US luminaries including JP Morgan CEO Jamie Dimon, BlackRock's Larry Fink and Blackstone's Stephen Schwarzman have all said they won't attend. And as Reuters added, SB's ties to Saudi stretch beyond the kingdom's investments. As US lawmakers step up their demands to sanction Saudi Arabia, or at least roll back arms sales, expect the controversy to continue weighing on markets as companies with secondary and tertiary connections to Saudi money start feeling the sting. Meanwhile, as Saudi's Gulf neighbors have expressed their solidarity with the Kingdom, the risks that an oil-price shock could reverberate throughout markets will only increase.